“WHAT SIZE GENERATOR DO I NEED?”…this is the most commonly asked portable generator question and can sometimes seem like quite a technical, challenging task. But for most applications, it’s actually pretty simple and straightforward – here we try and make it easy for you. Read on for more detail how to go about completing each of the steps. Then we have also included some useful case studies below of customers with some very common applications and how they correctly sized their portable generator. Note: this sizing advice relates to portable generators – if you are after generator sizing advice for a large stationary generator, then you may need to engage an electrician. 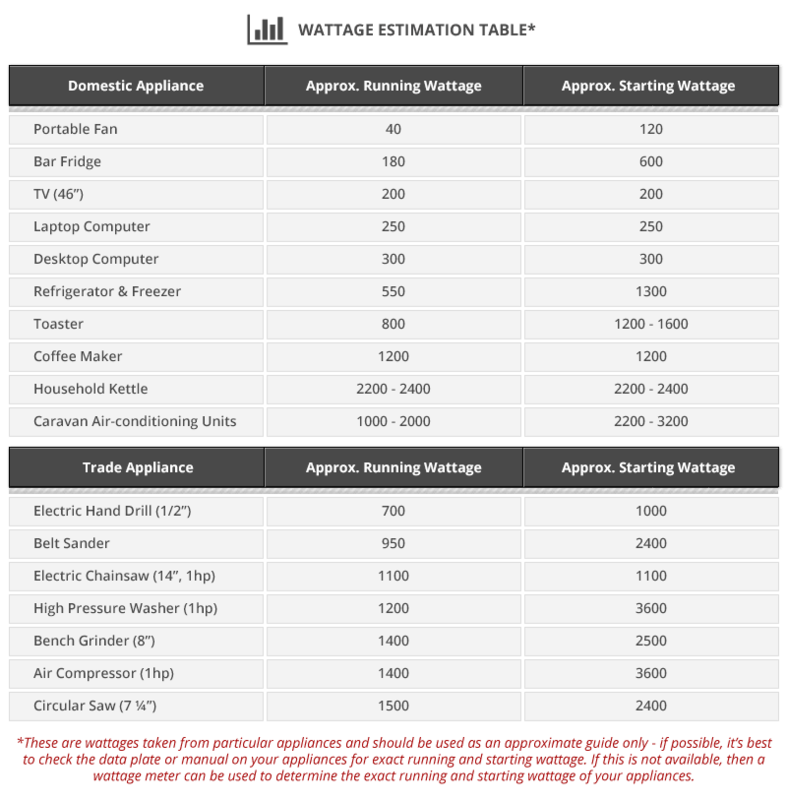 Determine the running (continuous) watts and starting (peak) watts needed for each appliance. In some instances, these will be the same – this is the case for appliances such as TV’s, lights and laptops whereby the starting and running wattage is the same. But in lots of other instances (i.e. appliances that have electric motors or heating elements) the starting wattage can be multiple (3-4 times or more) of the running/continuous wattage. Examples of these types of appliances are; fridges, air-conditioners, microwaves, electric deep fryers, coffee machines, hair dryers, pumps, drills, grinders, saws etc. These appliances have motors, compressors or heating elements that will surge to a peak power demand then drop back down to a lower running/continuous amount. So where applicable, it is very important you obtain the starting wattage for your appliance, because if your appliance(s) draw more power when surging than the generator can produce, then you won’t be able to run your appliances. Your Caravan Air-conditioner draws 2300 watts at start up and drops back to 1000 watts continuous. You wisely opt for a Yamaha EF2400iS which produces 2400 watts at peak and 2000 watts continuous…a good fit for your Caravan air-con unit. The Water Pump on your farm draws 30 Amps (7200 Watts) to start up and then drops back down to 1800 watts to keep running. You opt for an 8kVA Powerlite Generator which can handle up to 8000 watts at peak; this is the most popular trade and farm generator. Simply add the highest starting wattage number (2300 watts) to the wattage sum of the other two appliances, i.e. 2300 + 200 +100 = 2600 watts. In this instance you choose a Yamaha EF2800iS which produces a peak power of 2800 watts and rated output of 2500 watts. You could choose a 2000w generator, as the highest starting wattage appliance (Fridge/Freezer) is 1280 watts and the sum of the running watts of the other appliances is 680 watts, so; 1280 + 680 = 1960 Watts. You would start first with connecting your Fridge/Freezer, then incrementally add your other appliances. However, if the two appliances with starting wattage requirements (Fridge/Freezer and Water Pump) both surged at the same time this would require 2760 Watts (1280 + 1100 + 200 + 60 + 120), then the 2000w generator would not produce enough power. It would trip the overload circuit breaker and stop producing power. Therefore if you wanted to run multiple appliances at the same time that have surging power requirements and their peak power demand will coincide, then you will need to choose a generator size that can handle the sum of the peak demands at any one time plus the sum of the running wattages for the remaining appliances. If this is the case, then you would need a generator that could produce above 2760 Watts. …So Barry and Sue needed a generator which could deliver greater than 2280 watts at start up. They purchased a Yamaha 2400iS which produces 2400 watts at max and was able to run their caravan air conditioner comfortably. It also served as a great back up option to charge their deep-cycle batteries if needed. Running all of the above at the same time means the two fridges could require a peak power demand together of 2150 watts and then you have the three other smaller appliances requiring a sum of 400 watts. So adding those two figures we know Glen needs a generator that can deliver greater than 2550 watts at maximum and greater than 1220 watts continuously. Glen purchased the Yamaha EF2800iS which delivers a peak of 2800 watts and rated power of 2500 watts. This unit is very popular for this type of application, as it also includes a long range fuel tank with up to 17 hours running time at quarter load; great for backup power at home during periods of prolonged power blackout. So as Nick would like to be able to run each of his pieces of equipment together at any one time, he needs a generator that can handle a peak demand of 7,400 watts and running power of 2,396 watts. He purchased the Powerlite 8kVA Generator which is a popular tradesman unit and delivers 8,000 watts maximum and 6,800 watts continuous running power.